You are here: Home / giveaway / Elder L. Tom Perry: An Uncommon Life – review & giveaway!! 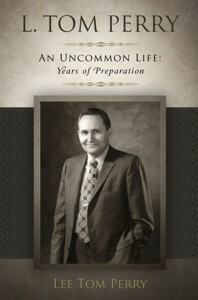 Elder L. Tom Perry: An Uncommon Life – review & giveaway!! general conference was only 2 weeks ago – can you believe that?! i love that weekend because i feel so inspired and uplifted – and by the time 6 months rolls around again i’m ready for another weekend-full of hearing all the great speakers! one of my favorite speakers is Elder L. Tom Perry. he always has something to say that i need to hear. so when i had the opportunity to read the first part of his biography, “Elder L. Tom Perry, An Uncommon Life: Years of Preparation” i just had to jump at the chance! i really enjoyed reading this and the insight it gave me into the life of this faithful Apostle of the Lord. it’s always amazing to me, especially reading biographies, how “normal” and humble most people are in terms of circumstances, but also how some of their experiences, work ethics, and faith can affect them so profoundly and can shape them into the types of people they are today. Elder L. Tom Perry is one of those people of whom i am amazed. Elder’s Perry life is a study in faithfulness as a man that was clearly being prepared by the Lord for his eventual service as an Apostle. from his early days as a missionary in the Northern States mission to his time in the Marines in the Pacific theater during WWII this was a man chosen by the Lord from a young age. whether as a missionary, a marine, a young husband and father, or young professional, and irregardless of his location across the world, Elder Perry was (and is) always faithful to the Lord’s teachings and ALWAYS in the service of others. the book also does a great job of explaining the family history and genealogy of Elder Perry and his roots. it is fascinating to see how vital a role his early family members played in Northern Utah, in particular the Logan community, and how they were faithful and persevered despite tough circumstances. i highly recommend this book and look forward to the subsequent one that will be published and will cover the second half of Elder Perry’s life. having just watched him in conference two weeks ago, i marvel at the fact that this man is 90 years old. what a great example of leading a faithful and service-filled life. his life inspires me. would you like to be inspired by and learn more about this wonderful man? here’s your chance to win this book!! just follow the easy entry options below. the more entries you complete, the better your chances are of winning! Disclosure: I was provided a copy of this book to read and review as well as a copy to giveaway. I received no other compensation and opinions are entirely my own. Thanks, Krista! Our church has some truly amazing people in it! I was disappointed to see you don’t offer a way to enter (like commenting on the post) for those of us who do not use any social media. It looks like a good book. Sorry about that, Tristan. I’ll keep that in mind for the giveaways coming up in the next few weeks. Thanks for your input. Would love to enter this but I don’t do facebook or twitter …pity!